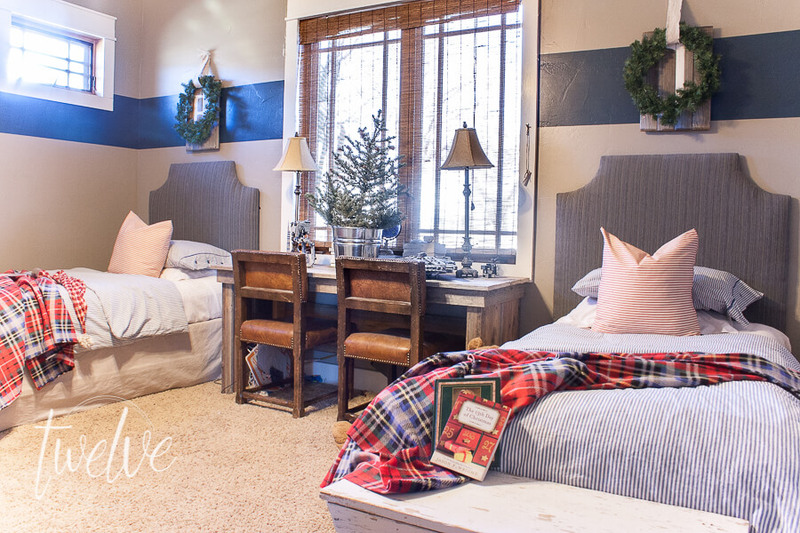 Well, my friends it is the last day of my farmhouse Christmas home tours. 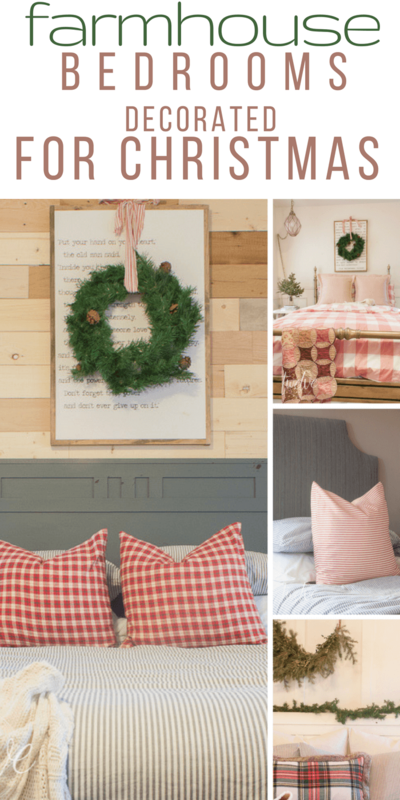 Over the past week, I have shown you my Christmas porch and entry, my cozy farmhouse living room, my Christmas tablescape, a farmhouse dining room and kitchen, and my neutral farmhouse Christmas tree. 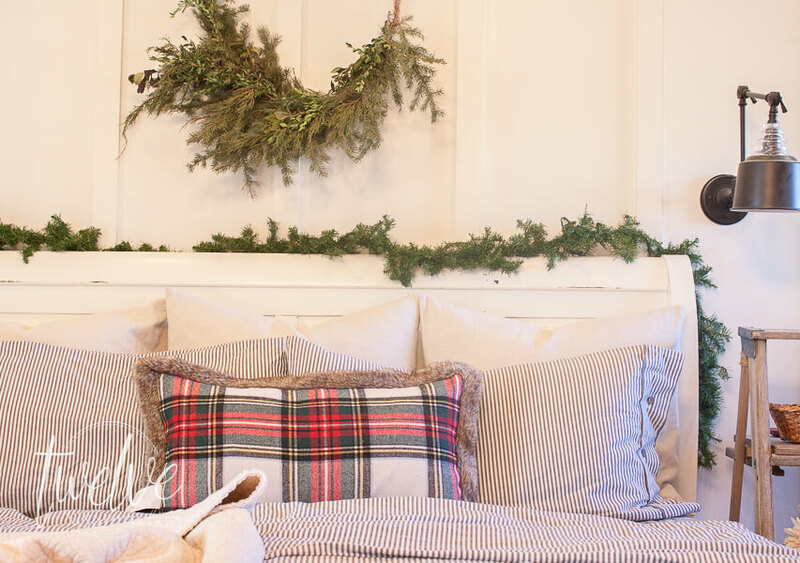 Today I am showing you how to create a cozy Christmas bedroom with little to no effort. I want to show you how I was able to create a bit of Christmas in each room. I am so very excited to be taking part in the Christmas tour of homes. 5 days, with 26 homes! You are guaranteed to be inspired by one of them. Now, I think it can be a bit overwhelming to think that in addition to decorating a tree, and a family room, dining room, entry…whatever you have. And by no means do I want to spend the whole holiday season decorating rooms and then taking them apart. 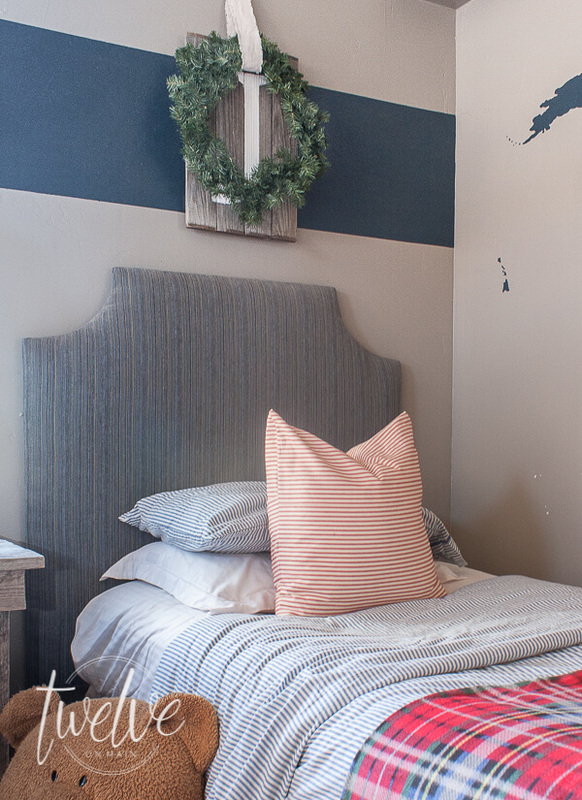 So, what I want to show you is how I added simple pieces to each room to create a cozy Christmas bedroom. 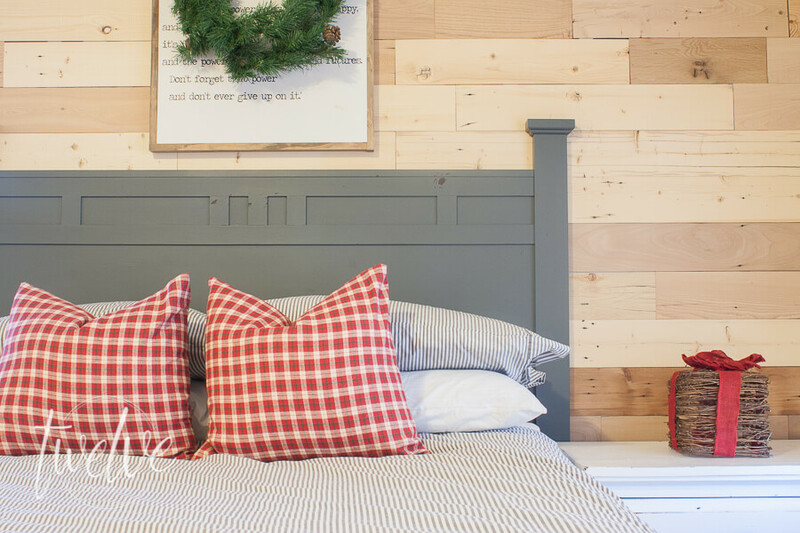 A few years ago I wrote a post about 5 things to do to create a cozy Christmas bedroom, and they are all very easy and actionable things that anyone can do. I am even simplifying it more today. Lets start with my boys bedroom. They share a room, and this room is constantly a mess! I spent more time cleaning the room than the actual decorating, photographing, editing, and post creation. It was so gross. But, the elements are simple, and they make a huge impact. Their beds are dressed in IKEAs blue striped bedding. This is something worth investing in, and it is actually a small investment. 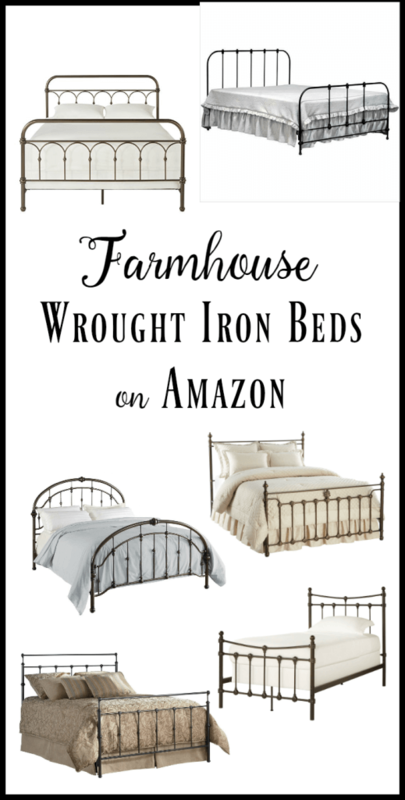 Its perfect for any farmhouse decor, or really any other style. 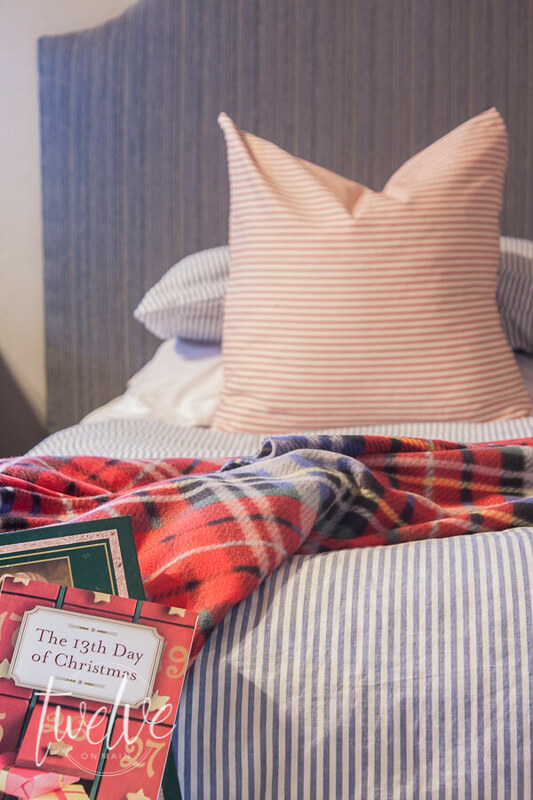 Have you read The 13th Day of Christmas by Jason Wright? My son is reading it right now and loving it! 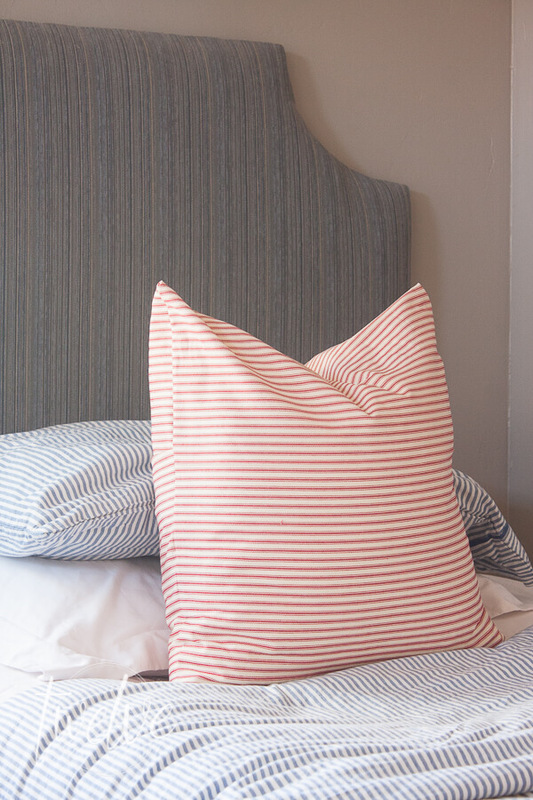 For this room, I added a red and white ticking stripe pillow, made my me with this easy envelope pillow cover tutorial. The fabric is from Joann’s, and you can always find a deal on it. Its something I always have in my stash. Its classic, and its a constant. 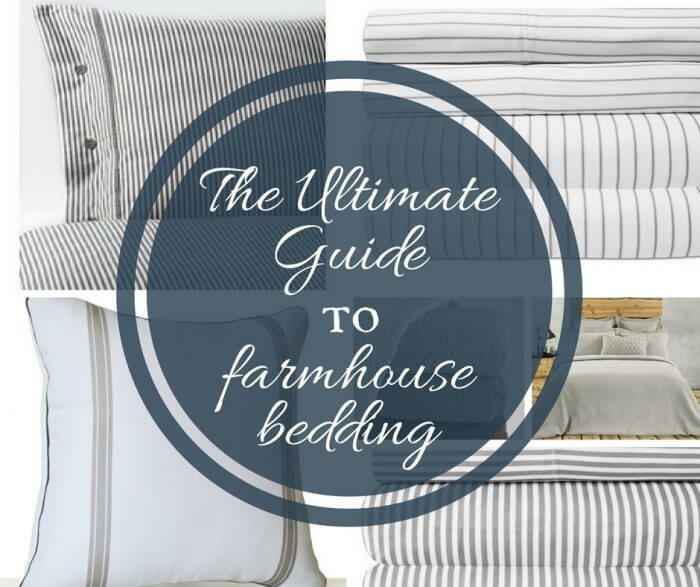 I also added a super easy fleece blanket to the end of each bed. I actually just got some plaid fleece fabric at the store and surged the edges. The kids are obsessed with them. The key was to find a fabric that went well with the space, and will be able to stay there throughout the year. I added a wreath above each bed, and these wreaths were cheap, like 5 bucks a piece at Walmart! Finally, I added a small tree to their desk, complete with battery powered twinkle lights, no need for a plug. Found something you love? Shop the room! Now, moving on to my daughters room, and by far my favorite! 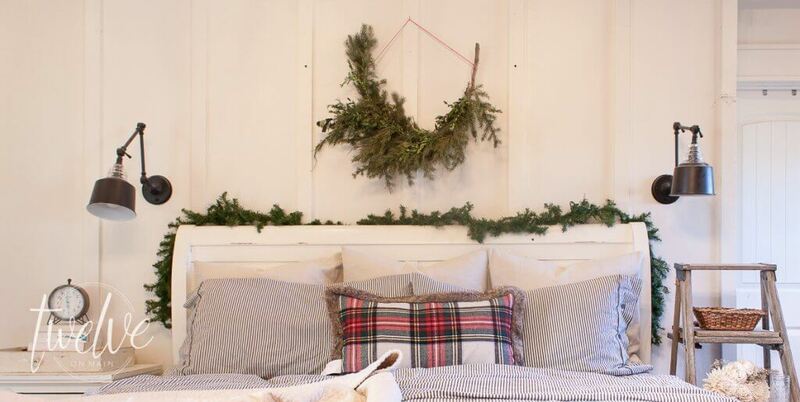 I don’t think it is necessary to rip apart the whole room and replace every element to create a cozy Christmas bedroom. No, I kept everything as is, and just added some simple elements. 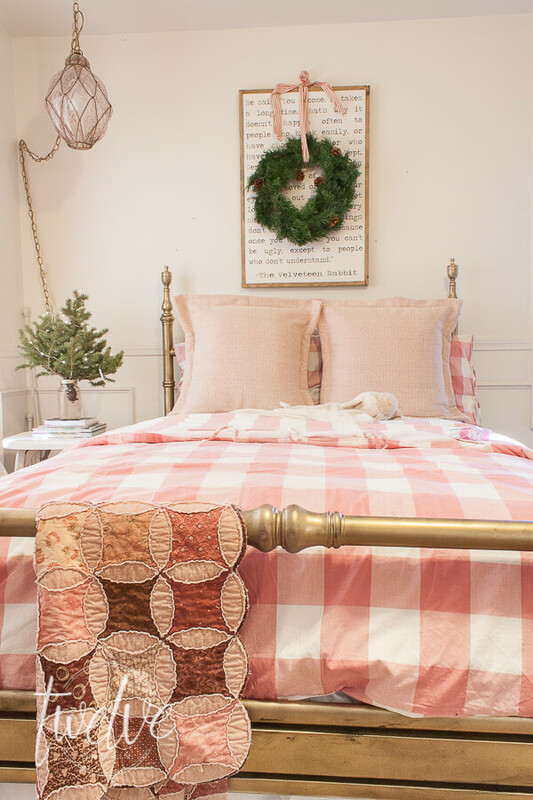 And I think the pink Ikea Duvet went so well with the Christmas decor. 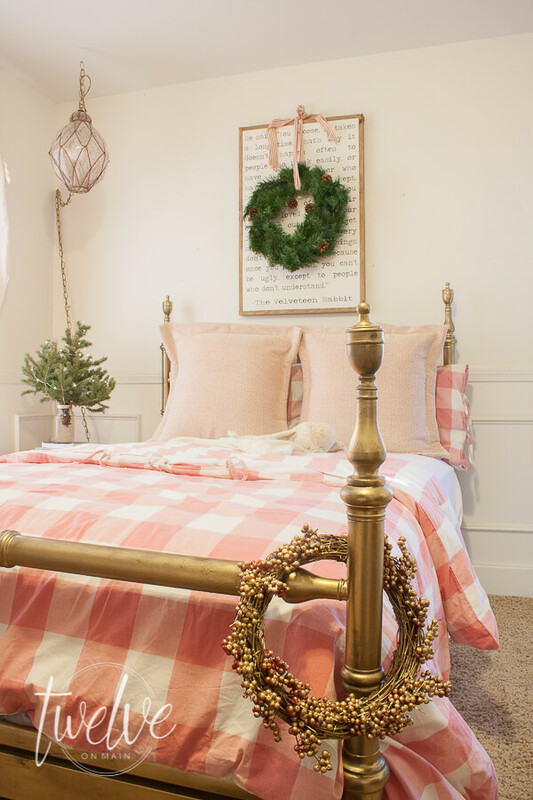 My daughter got a wreath above her bed, some battery powered twinkle lights on the bedframe, a sweet little tree on her nightstand, and a gold wreath to the end of her bed, which was a happy accident! I love the calming look of her room. If I had this room when I was her age, I would have been thrilled! My oldest sons room also got a similar treatment that the other two got. 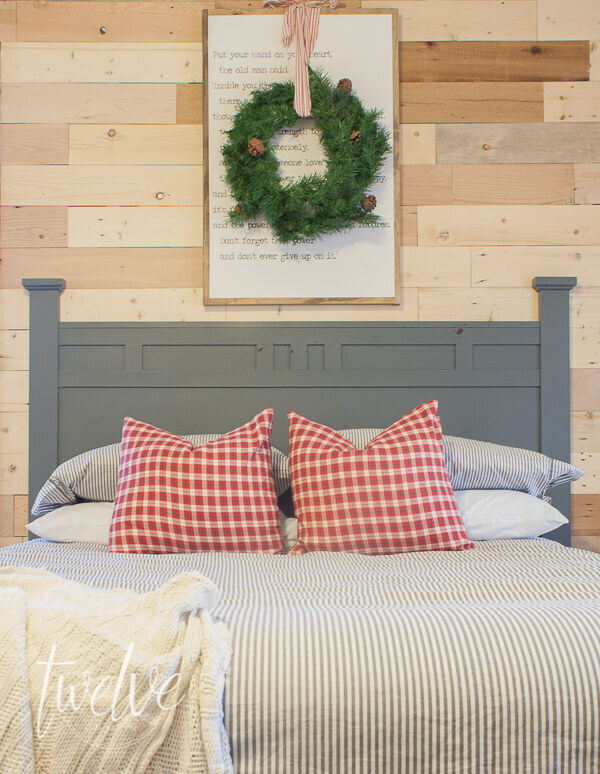 He got a wreath on the farmhouse sign above his bed, and a few simple Christmas pillow covers made from fabric from Joann’s. I used the same pillow tutorial as before. I added a simple vine present to his nightstand. I love these presents. I got them at The Home Depot and have used them everywhere……I mean, I got 3 sets, so I had plenty to go around. Love something? Shop the room! Last is my bedroom. I kept things really simple here. 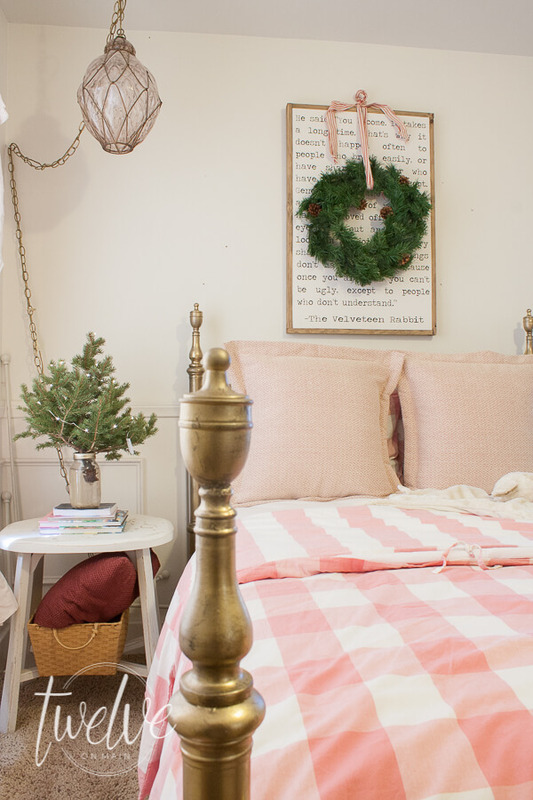 A Christmas pillow, a handmade evergreen swag above the bed, and some garland draping the bed. 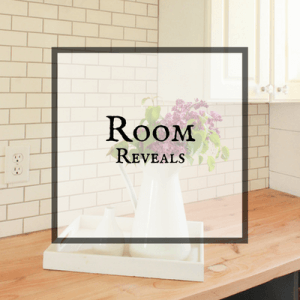 If you want to see a full tour of this room makeover click here. I also added a tree to the other side of the room, and set up a few of my vine gifts under it. Just simple. I really only wanted to have some twinkle lights in my bedroom. I love having that. Find something you love? Shop the room! 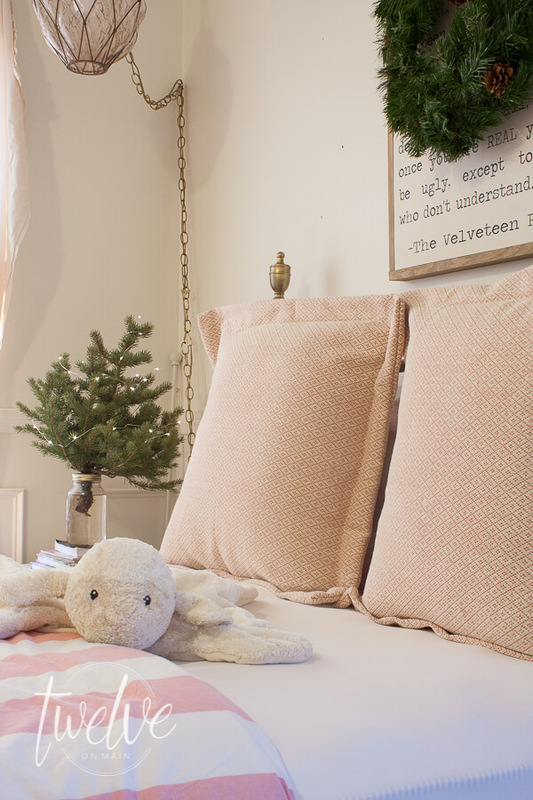 So, that my friends is how I create cozy Christmas bedrooms that each member of the family can enjoy. 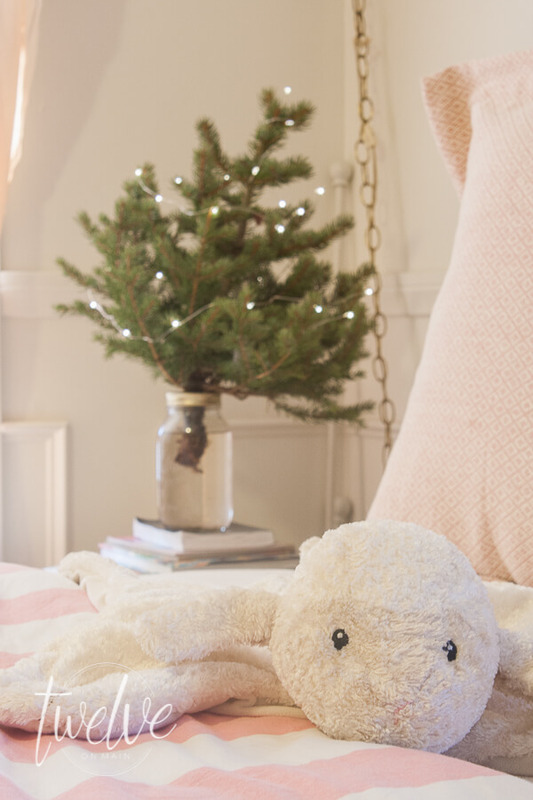 Why not bring a little bit of that Christmas magic into the bedrooms. I know my kids absolutely love the extra attention that it is given and they appreciate the time I spend making it a magical place for them to rest their heads. 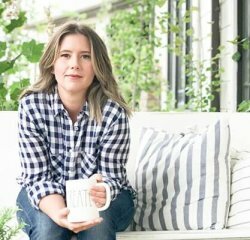 Now make sure to check out more of the amazing bloggers sharing their holiday homes. Have a great day! And make sure you have a wonderful holiday season! Your home is decorated beautifully and I love the wreaths over the beds. That is such a pretty touch. Thank you so much for joining us for our first Christmas Tour of Homes! Merry Christmas to you and your family. Thanks so much Sherry! Have a wonderful holiday! 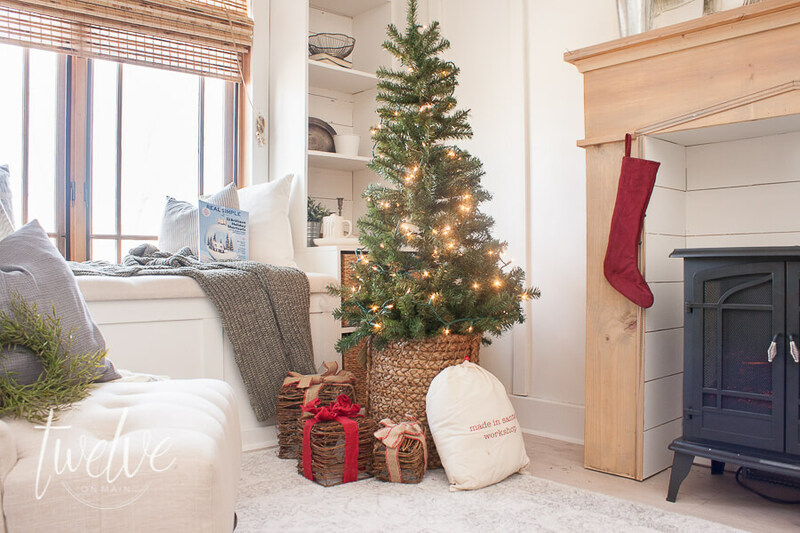 All of your bedrooms are so pretty, and I love the simple touches you added to bring holiday cheer to each room. don’t you just love happy accidents? Thanks so much for joining us this year for the Christmas tour of homes! 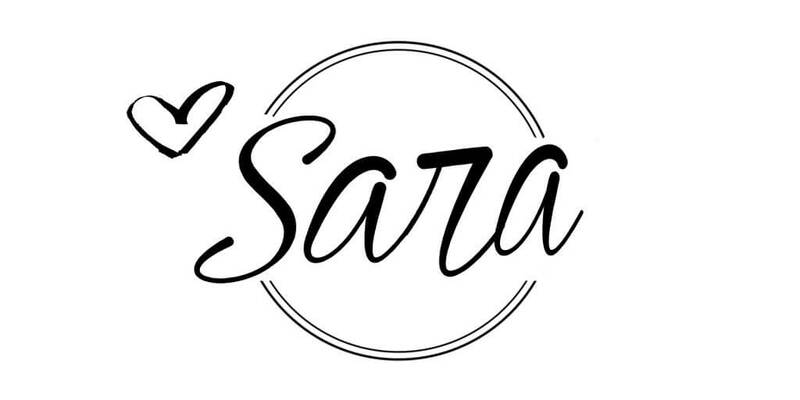 Sara, as soon as I finish typing this I am popping over to see the post on your Master Bedroom…just your little sneak peak has me wanting to see more. It really is simple to add just a wee bit of Christmas and holiday to each room, thanks for the inspiration. my daughter will be coming home from college next week and you have inspired me to add a little Christmas to her room before she gets home as a surprise. Thanks again for joining our home tour. It was such a great success because of such beautiful homes and great ideas like yours. Have a very Merry Christmas my friend. 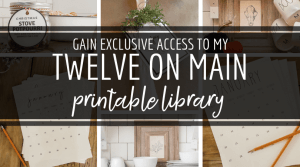 Thank you for sharing your beautiful home as part of the blog hop! I love the idea of buying fleece at the fabric store and simply surging the edges. 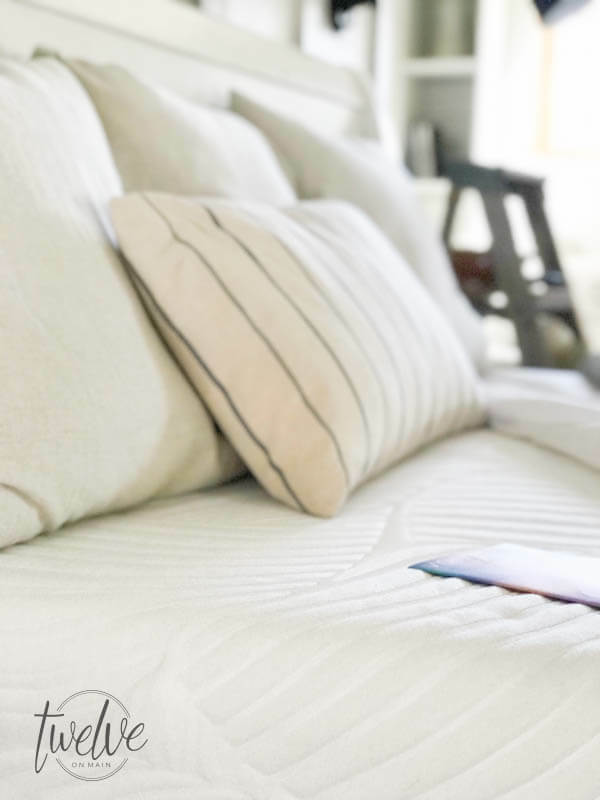 Buying multiple blankets can get expensive. I bet your kids are so excited to have a little christmas cheer in their rooms. Happy Holidays! Hey! Thanks so much! 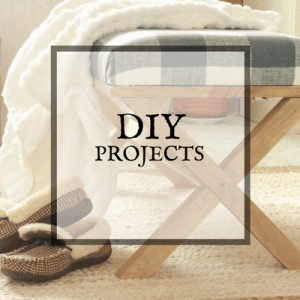 My kids love their rooms, and they love their fleece blankets. I ended up using the Luxe fleece and its so warm and heavy. Just what they like! Sara, all the ticking in red and blue and the checks are the ultimate farmhouse Christmas decorations. Love the combinations of patterns in your bedroom on the pillows and coverlet. Warm, cozy, and so inviting. These bedrooms are so cozy! 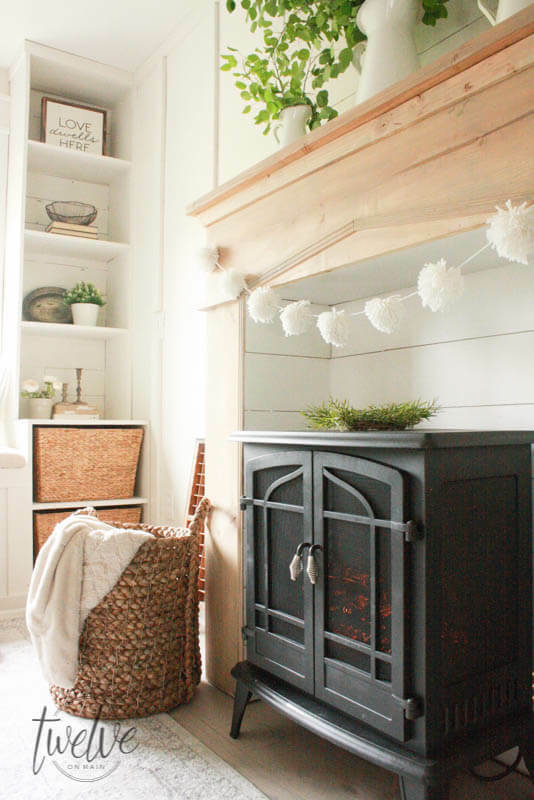 I love how you have that fireplace in your room – perfection! You have such a beautiful home and I’m so glad to have been on this tour of homes with you! Merriest of Christmases to you! Thanks Jen! So glad to be apart of it! Cant wait to check out all the other amazing homes! Sara, I couldn’t help myself, but I had to check out the links to the rest of your Christmas decor. Everything is really gorgeous! I like adding a touch of Christmas to every room, too; even the bathrooms. 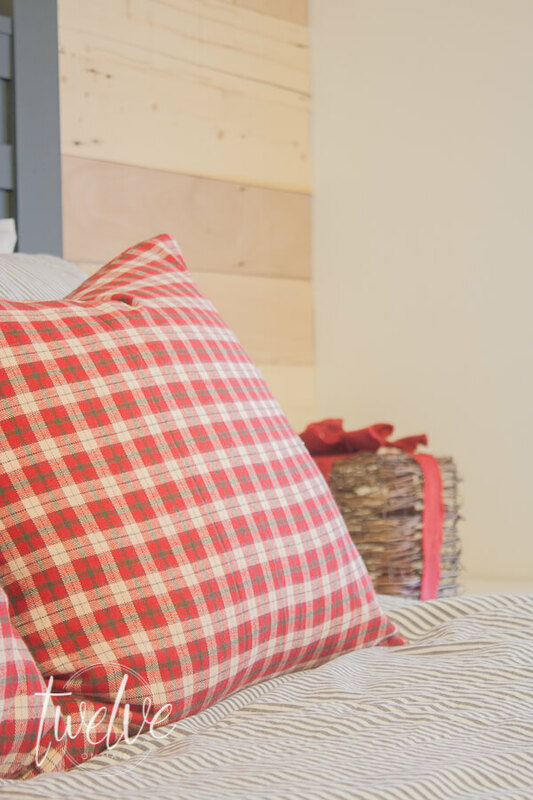 I love the plaids, checks and blue and red ticking fabrics you used in your rooms. 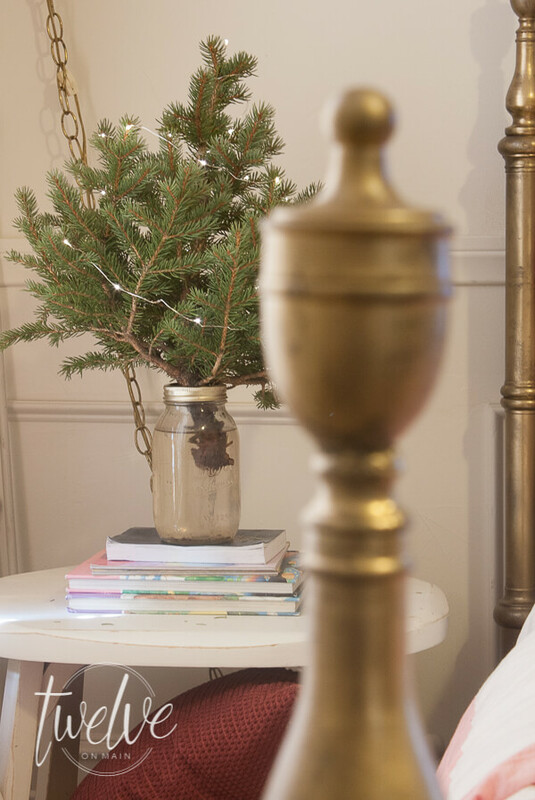 It’s been great meeting you through this blog hop, and thank you so much for joining our Christmas Tour of Homes! So glad you did! And isnt it so fun adding Christmas to other rooms? It just makes the whole home festive.